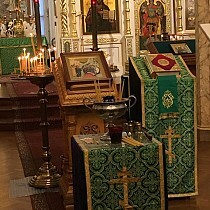 On Monday, October 8, the feast of the repose of Venerable Sergius, Abbot of Radonezh and Wonderworker of all Russia, Metropolitan Hilarion of Eastern America & New York, First Hierarch of the Russian Church Abroad, celebrated Divine Liturgy in St. Sergius Chapel in the Synodal Headquarters in New York City. His Eminence was co-served by the senior priest of the Synodal Cathedral of the Sign, Archpriest Andrei Sommer, Archpriest Serafim Gan (chancellor of the Synod of Bishops), Abbot Tikhon (Gayfudinov; abbot of Holy Protection Skete in Buena, NJ), Hieromonk Zosimas (Krampis; rector of the Synodal English Mission), Protodeacon Nicolas Mokhoff & Deacon Pavel Roudenko (cathedral clerics), and Protodeacon Serge Arlievsky & Deacon Nicholas Ilyin (clerics of Holy Dormition Convent "Novo-Diveevo" in Nanuet, NY). Singing at the divine services was the Synodal choir under the direction of Peter Fekula. 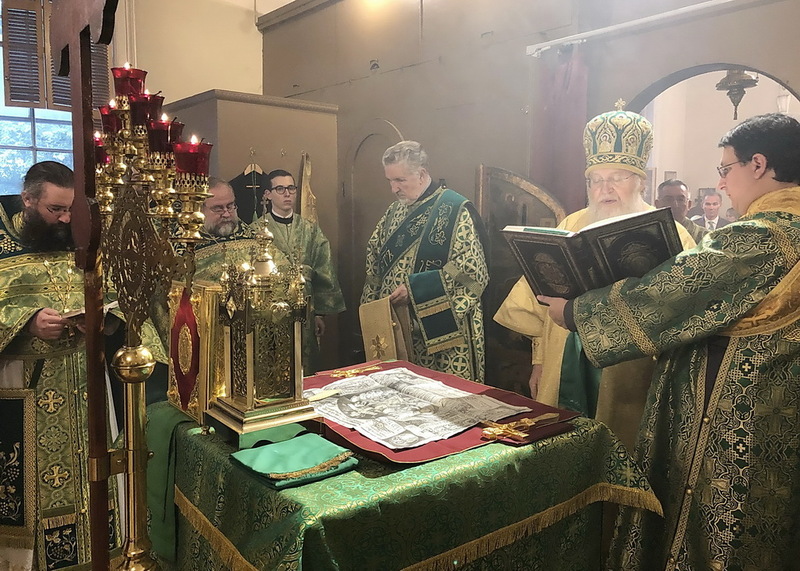 Despite the services falling on a workday, numerous parishioners and faithful from other churches of the city came to Liturgy to honor the all-Russian elder and ascetic – Venerable Sergius. Many of them received Christ’s Holy Mysteries. Upon conclusion of the service, Fr. Tikhon addressed those gathered with a sermon. In his homily, he in part drew the attention of parishioners to the life of St. Sergius, which was "extremely simple; therein are no allegories, metaphors, or parables, but rather a simplicity of presentation." "There lived a certain boy, the son of ruined landlords. They lived in great poverty, but he had something that set him apart from the environment not only of his peers, but also of every person who lived in his and in our time. The boy had the gift of prayer, but he did not ask God for earthly blessings, greatness, glory, authority, or wealth. He asked God for only one thing: that the Lord endow him with the ability to literacy, in order that through this he might become acquainted with the Holy Scriptures. "It occurs to me, how in like manner the holy King Solomon chose for himself only a single petition – to possess wisdom. And the Lord, surprised by such a request, gave him wisdom, but through this wisdom gives him glory, and greatness, and fame. "The same thing happened with St. Sergius. The Lord opened his mind to the understanding of Scripture. He began to study grammar, and at the time when he lived, the young men and young ladies studied grammar from the books of the Holy Scriptures, mainly from the Psalter and the Horologion. And he started to study these spiritual books and, when he became a man, the only thing that he chose for himself was the feat of prayer, life removed from worldly vanity and passions, to keep his struggle secret. "But we know that a city on a mountain cannot hide. And so St. Sergius was honored with fame that spread throughout Russia and throughout the world. "The saint lived in the XIV century, and this was a time of internecine conflicts, disorder, raids on Holy Russia. The great changes in Russia are connected with the feat of his life and prayer: the cessation of civil disagreement between princes and even of diseases. And all of this is the merit of one person, who devoted his life to the feat of prayer and his country," – said Fr. Tikhon. "I remember when I first crossed the threshold of Holy Trinity-St. Sergius Lavra, the person who conducted the tour told us: ‘At the very center, you will see Holy Trinity Cathedral. 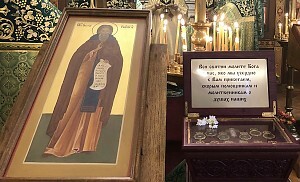 This is the center of the Lavra, and if you enter it, you will see the incorrupt relics of St. Sergius in the very center of the cathedral.’ We did not understand his parables. How could they be at the very center, when they are on the solea, in the corner? And without any embarrassment, he continued to say that the relics of the venerable elder were the very center of the cathedral. And then we understood his logic, understood that both Lavra itself and the relics of St. Sergius are the center of Russia, because Russia takes her beginning from here. And the abbot of the Russian land prays that the fire of faith, his prayers would also touch our hearts, because we need spiritual enlightenment, grace, and salvation." 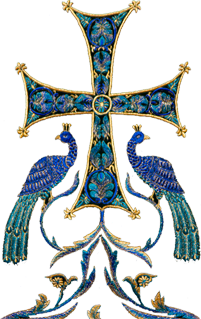 Metropolitan Hilarion congratulated the clergy and faithful with the feast day, and congratulated those celebrating their namesday, wishing them good health, God’s help and the intercession of Venerable Sergius. His Eminence also thanked those who labor in the temple during the week and the choir, and wished them health and strength. After Liturgy, a festal meal was served.